Hanbury Bees: Extracting honey - or how to coat the entire house with a thin layer of honey! The supers were brought in and put in two big piles, 15 in total from 6 hives. Not every frame in every super has honey in it, because I like to give the bees room to move around in the hive (overcrowding is one of the triggers of swarming, and you don't want to lose half your honey collectors in a swarm!). The room was emptied, cleaned and the extraction kit brought in the day before (has to be packed away for the rest of the year, it is the utility room really!). There are several bits of kit that I use for extraction. The extractor is a little bit like a farmer's combine harvester. It is only used for a short time each year, but when it is needed it is the only way to get the job done. Having said that, in the same way that farmers sometimes share combines, local beekeeping associations often share extractors around their members. My extractor looks like a large plastic drum. In fact, it is a large, food grade drum! Inside is a cage on a vertical spindle which is rotated using a crank handle. Ten frames of honey can go in at once and then the lid goes back on and you start winding slowly. It works like an old fashioned spin dryer, the frames spin round and the honey is thrown off by centrifugal force. The honey lands on the inside of the drum and runs down the walls to collect in the bottom of the drum. Once some of the honey has been thrown off the frames you can start winding faster. If you go too fast though, the weight of the honey in the frames is too much for the honeycomb to support (after all it is only made of beeswax!) and the centre of the honeycomb 'explodes' throwing bits of honeycomb around the extractor. This then clogs everything up and you usually have to get the big bits out from between the inside of the drum and the cage before the extractor will spin properly again! 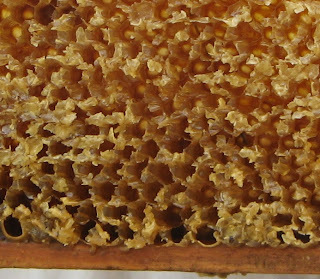 To try and make the honeycomb stronger, the bee equipment suppliers usually put a thin zig-zag wire into the centre of the embossed wax 'foundation' that you give the bees to start building the honeycomb on. Before the frames go into the extractor you have to cut the 'cappings' off the honeycomb. When the bees have finshed turning the nectar they collected into honey, they store it in the honeycomb and cover the cell with a 'lid' of beeswax to protect it. Before the honey can be spun out of the honeycomb this lid or 'capping' has to be removed. For a long time I used a bread knife to cut the cappings off in a big sheet, but this year I have bought a gadget called an uncapping fork. It looks like a 3 inch wide fork with about twenty pointed tines. The fork is used to scratch the cappings to break them. Once they are broken open the honey can spin out in the extractor and the wax cappings join them in the honey, to be filtered out later. Some of the honey leaks out when you are removing the cappings so I do this over a large metal tray to catch the drips. Then each frame is put into the extractor, trying to balance it with full frames opposite full frames. If you don't try to balance the extractor it behaves just like the old-fashioned spin dryers and tries to wander around the room when you spin it! Once the honey has been spun out of a batch of frames, they come out of the extractor and are put back into the super. There is still some honey clinging to the sides of the honeycomb, making everything sticky. These supers with 'wet' frames will be given back to the bees. They clean up all the honey and store it for themselves for the winter. 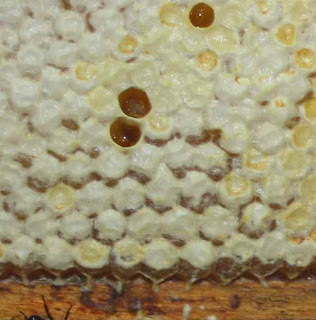 They also tidy up the broken wax edges of the honeycomb where it was opened before the extraction. After a couple of 'spins' there is enough honey at the bottom of the extractor to drain it off. At the bottom there is a large (about 2 inch diameter) gate valve. This allows the honey to be drained off into a container. The honey at this stage contains bits of wax and also other detritus (bees etc!). Before it can be bottled it needs straining. I find that the straining works better if the honey has been slightly warmed to make it a bit more runny. However you do have to be very careful because heating honey causes it to lose the volatile elements that contribute to the flavour. 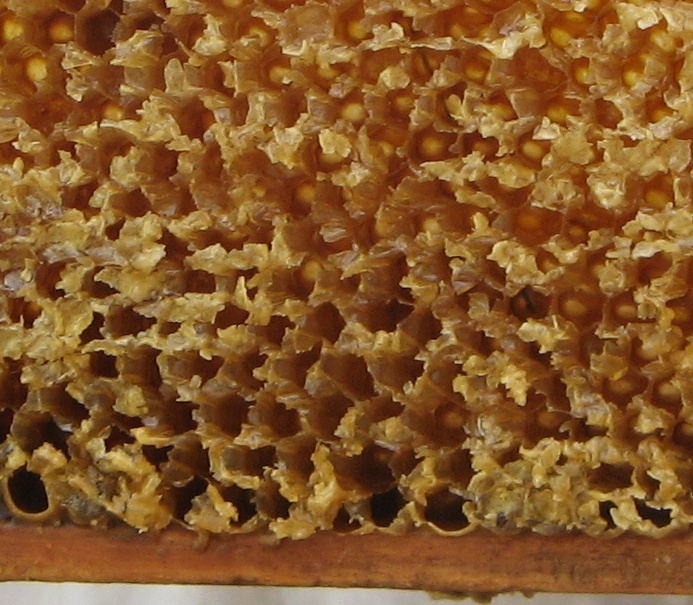 Overheating can damage honey to the extent that it can only be sold for baking. My filter is a combination of a coarse metal mesh filter and a metal mesh filter so fine that it moves like a fabric. This sits on the top of a large stainless steel drum (well large for me, it holds about 100 pounds of honey when it is full and is so heavy to move that I fill it up on the worktop rather than trying to move it full!). This drum, or 'ripener' holds the filtered honey for a couple of days so that any small wax particles float to the top where they can be skimmed off. There is another two inch gate valve at the bottom so that jars can be filled directly from the ripener. By the end of the day I have extracted all 15 supers, and have three drums of filtered honey, a pile of wet supers and honey on every surface I have touched. Still only three more jobs, give the supers back to the bees and jar the honey. They can both wait for another day, but the third job, cleaning the extraction kit and room and returning it back to its normal, non-sticky state has to be done today or my marriage will suffer!